Open Compute Project conference points to need for speed and extending existing technology. Two conflicting goals are emerging inside of data centers—speed at any cost, and the ability to extend hardware well beyond its expected lifetime to amortize that cost. Layered across both of those are concerns about how to move data back and forth more efficiently, how to secure it, and how to best integrate different generations of technology. But these widely different goals have created headaches for data centers, and opportunities for a surprisingly wide swath of new technology, particularly on the hardware side. Much of this was in full view at the Open Compute Project Summit last month, where silicon and hardware innovations were the key focus. On the raw performance side, Nvidia showed off its internally built NVlink interconnect fabric, which supports hyperscale computing based on massively parallel GPUs. Nvidia isn’t contributing NVlink to OCP, but it is tapping into the group’s focus on the need for faster movement of data for the most compute-intensive tasks. Microsoft engineers discussed their new “Project Olympus” platform, an eight-GPU ‘hybrid mesh cube’ in a modular chassis that interconnects via NVlink, as well as standard PCI Express. But the real focus was on NVlink, which is 5X to 12X faster than PCIe gen3. This is not as easy as it sounds, of course. While GPUs have become a key component in AI and neural networks, which rely on massive parallelism, the integration of heterogeneous processing elements remains a challenge. It’s particularly difficult in complex heterogeneous architectures. The OCP advance program also listed a session on “the OCP HPC interconnect silicon spec,” which according to OCP can build on existing mainstream technologies such as PCIe, RapidIO, Infiniband and Ethernet. It was not listed in the final program, although it may be something to watch for in the future. Marvell, Nvidia, Qualcomm, Cadence and Cavium all said they hadn’t heard much about it. The OCP program did cover a tremendous amount of ground, though, including the Switch Abstraction Interface (SAI) ASIC work being done at Microsoft with the support of 77 other contributors, updates from Western Digital on SSD drives, and a peek into how Facebook runs data centers worldwide with eight generations of architectures at once (OCP and non-OCP) to keep its 1.8 billion monthly users satisfied. One of Facebook’s prods for suppliers was the top of rack switching topologies that are now prevalent. 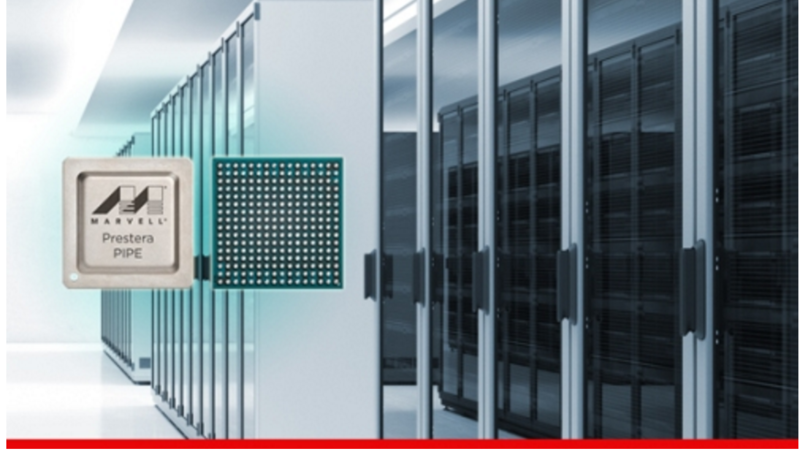 Marvell discussed its new PIPE port extender for these environments, where high-end speed- and port-density chassis need to connect to already deployed lower-speed Ethernet ports. This is the other end of the spectrum, where existing technology needs to be extended and improved without massive investments or a complete rethinking of the data center architecture. A typical board for this application normally would be 16 to 18 layers. The goal here is to reduce that as low as 8. “Traditional equipment goes away at about 100 watts, and you are out of the box with the optics,” Zimerman said, noting the central management entity is a control bridge on the SPINE switch, and this is enabled by a IEEE 802.1br control plane. The PIPE device can fan out 10 or 12 ports of 10 Gigabit Ethernet. A wild card with a sizable presence at OCP was Qualcomm, showing a bit more about its Centriq 48-ARM core 10nm server processor. The silicon is sampling now, said Ram Peddibhotla, vice president of product management for Qualcomm Datacenter Technologies. Qualcomm is collaborating with the Microsoft Windows Server team to see this processor work with Windows Server, a product only used internally at Microsoft today. “It’s really a collaboration between our two companies that spans the full spectrum, so we can accelerate Microsoft Cloud services,” he said. Peddibhotla worked at Intel in software and services strategy for 18 years before coming to Qualcomm two years ago. Qualcomm isn’t yet disclosing die size, the fab or power consumption. It may later this year. What is known is this will enable 32 lanes of PCIe gen 3. Semiconductor improvements add up to big savings in power and performance. More chipmakers turn to software-hardware interaction for performance, power, security.